God Roles kills careers of actors....Are you agreed?? Remember the late 80s, when shows like Mahabharat and Ramayan took over the small screen - with fans worshipping the TV screen each time Ram appeared or when Krishna motivated Arjun in the battlefield? It is no secret that actors playing divine characters usually attain a 'God-like' status for viewers. However, when these actors let go off their on-screen divinity and go for mortal roles, the same viewers find it difficult to embrace their devis and devtas' lesser, commonplace avatars. We speak to actors and industry people to understand why the on-screen God stereotype remains immortal and whether playing a divine character is a career-killing move. People see you as god Swapnil Joshi, who played Krishna in the TV series Shri Krishna, agrees that people stereotype you, and often go too far. He'd told us earlier, "It was a different era when I played Krishna. People would consider your character to be God. I was all of 16 at that time, and people would come and touch my feet. In fact, some even brought their sick relatives to me and asked me to cure them. Many people who played mythological characters could not come out of that image. But I knew that somewhere I was only a medium for them to visualize Krishna." 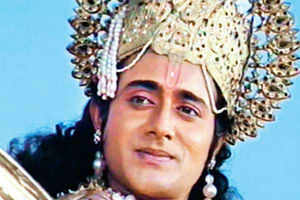 Arun Govil, who is still revered as Ram by people, says, "The Ramayan I was a part of, was quite well-made. The shows at that time had high production values. Of course, as an actor, each one of us contributed, but it turned out to be quite good. People still remember me as Ram. Even now they come and touch my feet. I was recently in Jaipur and two people came and asked me, 'Are you the guy who played Ram in Ramayan?' and when I replied in the affirmative, they touched my feet. Somehow, my image as Ram is etched in people's minds. I think the benchmark set by Ram was so high that the other things which I did after that failed to surpass it. It's because the image of Ram is so strong that I wasn't offered many good roles or negative roles after the show. After that, I realised that it is of no use waiting for roles and I decided to step away. Now I am associated with social groups and am happy." Blame the actor, not the role? While some people feel that it's the role that doesn't allow you to come out of the iconic image, others feel that it's the decisions of an actor that determine the course of their career. Nitish Bharadwaj, who played Krishna in Mahabharat, says, "When we did those shows, most of us were newcomers. Except for Mukesh (Khanna) and Puneet (Issar), all of us were new. We gave our sweat and blood to our characters and didn't care about the monetary aspects. Money and fame came as a result of our hard work. The serial became a landmark and our careers also got a big boost. While doing Mahabharat, I did Sangeet with Madhuri Dixit and Nache Nagin Gali Gali with Meenakshi Seshadri which did well. I don't feel I got typecast as Krishna, however, I would like to add that when people love you in a particular part, that role somewhere becomes your identity. In my view, we are all what we are because of our decisions. The impact of each person's decision is only known after a point of time. I was doing good films, but my own errors impacted my career. It was in 1992, just after Mahabharat, that I moved to UK. In 1996, contesting elections was another mistake. These two decisions were responsible for me not getting enough roles. Shah Rukh, Govinda, Akshay Kumar and Salman are all my contemporaries and they are quite popular in films. I lost focus and made errors but now I have decided only to focus on films - be it acting or directing them,"
Prem Sagar, creative director of the first Ramayan, who is presently involved with Jai Jai Jai Bajrangbali, echoes, "It all depends on the actor and the kind of roles he chooses. Swapnil Joshi has made a name for himself in Marathi cinema and his recent film has proved be the highest grosser in Marathi cinema. He reinvented himself after that role and is quite popular. I feel that an actor has to exercise caution in choosing the roles he does after playing the character." Fresh faces preferred over popular ones If on-screen Gods can't be accepted in any other roles, then known faces can't be accepted as Gods either. TV serial makers preferred to cast relatively new people for such shows, so that they would look believable on screen. "The actors who were a part of such shows were new and had no particular image of their own. If you rope in daily soap actors, people aren't able to identify with them since they have seen them in a different character. Even if a known face plays a pious character, people would not be able to relate to her. Taking new people is a creative call," opines Sagar. I think this was generally true in the olden days. While the actors' choices do matter in how successful they become in their career, the viewers' mentality also makes a huge impact. For some reason, the viewers of the 80s viewed the actors with the same reverence as they viewed God, which was not right. Many of the viewers of that generation could not separate reel from real. For them, Arun Govil was Ram and Nitish Bharadwaj was Krishna. They were not ready to accept these hard working actors in other roles, which then impacted what kind of offers they got after Ramayan and Mahabharat were over. So that's one of the biggest reasons why mythological shows cut down an actor's career in the previous generation. However, I would say it's not the same now. Today, actors can play mythological roles without losing their career. For one, today's generation is less interested in mythological shows as compared to saas-bahu dramas, so the risk of "typecasting" an actor in God's role is much less, but also, I think the mentality of the general audience has matured. Even popular mythological shows of the current generation have not typecasted its actors, and they are able to get popular roles afterwards. I think it has a lot to do with the mentality of the audience, and of course the choice of the actors. Actors should be versatile, ready to take risks and not limit themselves to certain roles, or else they cannot break away from a certain image. But the audience should also learn to separate reel from real. No actor is the face of God, no matter how great and talented they may be, and it's important to remember that, both for the actors' benefit and our own. I am not watching Gurmeet Debina as Ram-Sita now. They are romantic jodi & ready for nach Baliye. same if Mohit-Mouni in Nach Baliye,i would like to watch. Yeah true, Gurmeet&Debina and Mohit&Mouni did a great job in their respective mythological roles, but for today's generation it is easy to differentiate them from their offscreen personalities. The same cannot be said for the older generation. Yes, the mentality of the audience matters too. But you couldn't really blame them. After all, in those days of Ramanand Sagar's Ramayan & BRC's MB, how many TV channels really existed? So, the audience had NO choice but to watch the actor in that particular role only. Now, of course, there are many more TV channels available, and even actors have greater opportunities to be more versatile, and experiment with their roles. And yes, the younger generation wants variety rather than deifying actors simply because they play "God roles" on TV. Having said that, even within a mythological TV show itself, if an actor (who, for example, plays Ram or Krishna or Mahadev) gets the chance to portray different kinds of characters within the same show itself, it can definitely make him seem more versatile in the eyes of the audience. And thus, this "God worshipping" of actors also gets reduced to a great extent. Mohit Raina himself has said that his portrayal of Jalandhar has finally made people believe that he is not Mahadev himself, but an actor who can portray Mahadev in an extremely convincing manner. And THAT is the reason why people admire his performance now, rather than the blind idolization which happened prior to Jalandhar. So, in Mohit's case, despite being associated with DKDM for almost 2 years now, he has still been able to prove his versatility in whatever roles he has been asked to play within the show itself. Also, fortunately for Mohit, DKDM is the kind of show that caters to the older AND younger audience both. DKDM has made Mohit a famous name, no doubt. But he started his acting career much before that. So, yes, while Mahadev may be his most famous role, but there is no doubt that he can play other kinds of characters too in an extremely convincing manner, if given an opportunity.